Brain Power founder, Dr. Ned T. Sahin, and many team members including doctors, educators, and engineers, have gone out into the community and met families touched by autism like yours. We have heard the challenges and hard days and successes of your or your child/sibling’s journey with autism. We know each person is unique and the autism spectrum is broad. However, some of your challenges resonate widely across the community. Parents, we hear you worry about what happens when you can no longer care for your child. Members of the spectrum, we hear the many difficulties in acquiring useful skills to help achieve milestones in life such as succeeding in school, finding a job, and courting a romantic partner. We try to address some of those broadly-applicable skills, in the science-based apps and games we make. Please sign up to be part of advanced research science, to assure that the Empowered Brain system is helpful for families like yours. 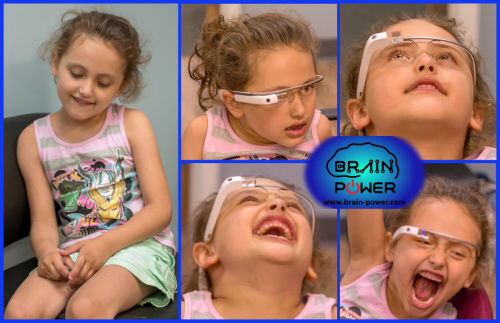 Brain Power has made the world’s first comprehensive wearable life coach for autism. The Empowered Brain system aims to empower children and adults all along the autism spectrum to teach themselves life skills crucial for self-sufficiency. We address a range of skills including emotion decoding, eye contact, speech, conversation skills, behavior and self-regulation, avoiding stress and meltdowns, and many more! Empower Every Brain™! Sign up below to be one of the special few families who joins the Clinical Trial and gets a chance to preview as well to shape our products. For trial sessions, you will need to travel to Cambridge, Massachusetts, or one of our other intake centers. Sessions last in total 1-2 hours, which includes time to fill a few forms. Note: Our on-site clinical trials are complete. Please join a Focus Group to influence the future of our product! Our onsite clinical trials are complete for now (you can read our published research papers! ), but we still value your input! If you would like a way to influence the future of our products, please join a focus group. You can do this from anywhere in the world – we meet digitally. Please fill out our contact form and a member of the Brain Power team will be in touch.